SCVHistory.com | Newhall | Pioneer Oil Refinery: Chevron Donates Nonproducing Asset to City, 1998. Pioneer Oil Refinery: Chevron Donates Nonproducing Asset to City. The Pioneer Oil Refinery in Newhall illuminated the Western frontier at the dawning of California's oil industry. Now the landmark will be preserved for future generations to study and enjoy. To Patrick Curvin, the idle smokestacks and empty stills of the old refinery in Newhall represented more than just another nonproducing asset of his employer, Chevron USA. Curvin, a Stevenson Ranch resident, has spent the last 10 years selling off properties throughout Southern California that once produced a steady stream of oil — and dollars — for the multinational oil giant but were tapped out long ago. "Chevron made a corporate-wide decision that any (oil) field that wasn't making a sufficient return shouldn't be part of a major international firm. In 10 years we reversed 100 years of acquisition history," Curvin said. In 1995 he negotiated the transfer of 3,000 formerly derrick-studded woodland acres in Towsley Canyon to the Santa Monica Mountains Conservancy, acreage that included the historic Pico Canyon oil town of Mentryville. When it came time to unload a tiny, 4&frac1;-acre parcel in Newhall last year, Curvin wanted to make sure it went to someone who understood its significance and had the means to preserve it for the education and enjoyment of future generations. "Chevron is made up of people, and a lot of them would like our history kept intact," Curvin said. "We wanted to get this property into the hands of an entity that could hold it in trust for the public." That's because this tiny parcel, tucked against the hills of Railroad Canyon in the heart of Newhall, contains the relics of the first successful oil refinery in the American West — and the oldest existing refinery in the world. Thanks to Pat Curvin and others, the citizens of Santa Clarita own it. The purchase price? Zip. Nada. Chevron donated it to the city outright. "The Pioneer Oil Refinery goes back to the roots of why Newhall became a town," said Santa Clarita councilwoman Laurene Weste, credited by Curvin with having gotten the city to accept the donation. "The refinery is a wonderful thing," said Weste. "Were it not for the discovery of oil, there might not have been a community here." Indeed, the construction of the refinery coincided with the founding of Newhall in 1876. It operated for only a dozen years, but those were an important dozen years: During that time, the refinery midwifed the birth of the oil industry in California. Its beginnings can be traced to the late 1860s when an enterprising group of men purchased an oil lease in Pico Canyon and, sans machinery, inched an augur into the dirt. From a depth of 50 feet they produced nine barrels of oil per day — the biggest bonanza yet seen in the Bear Flag state. One of the men was Sanford Lyon, the owner of a combination tavern, telegraph office and stagecoach stop where Eternal Valley Cemetery sits today. His success at oil exploration prompted others to try their luck, and before long, hillsides were being dug up all over the Santa Clarita Valley. Nature's bounty couldn't be used in its raw state. It had to be refined to be profitable. In April 1874, Lyon's partners erected a small, 15-barrel still behind his stagecoach station. It was a failure. Oil was chiefly used as an illuminant, and Lyon's partners simply couldn't produce a kerosene that didn't smoke when lit. In 1875 the small refinery closed. Enter Demetrius Scofield and John A. Scott, two highly successful oil men from Pennsylvania who would use their eastern expertise to revolutionize California's fledgling oil business. Scofield snatched up Lyon's oil claim and hired another Pennsylvania transplant, one Alex Mentry. to deepen the hole. Mentry used the latest techniques (and one of the first steam-powered oil rigs in California) to produce a staggering 30 barrels of oil per day from the old Lyon well and a similar amount from others. A refinery was needed now more than ever. Andrew Kazinsky was in the right place at the right time. He was ready and waiting when the first Southern Pacific locomotive roared past his new stagecoach station near present-day Pine Street in August 1876. With direct rail access and bountiful supply of groundwater, "Andrew's Station" was the perfect place for a big, new refinery. John Scott was the man to build it. Scott had installed a second 20-barrel still at Lyon's Station in June, but when he saw that the trains were headed for Andrew's he moved the two stills there. Under Scott's supervision they processed 25 to 40 barrels of refined oil per day. The following January, Scott added a 120-barrel still that had been fabricated in America's original oil town of Titusville, Penn. By the time a fourth and even larger 150-barrel still was added a few months later, the refinery was an unmitigated success. Oil itself was used in the distillation process. Residue from one refining run was used to fire the kilns for the next. Tremendous amounts of thick, black smoke must have belched into the Newhall air from the tall brick chimneys. It was a dirty process but a profitable one. The Pioneer's products illuminated ships, railroads, factories and mines throughout the Western frontier. The breadwinner was a clean-burning kerosene that lit homes from Ventura to San Francisco. It was a heady time for the captains of a brand-new industry in California. As one oil field played out, 10 more came online. Tremendous finds in places like Richmond and San Pedro turned the state into an oil exporter. 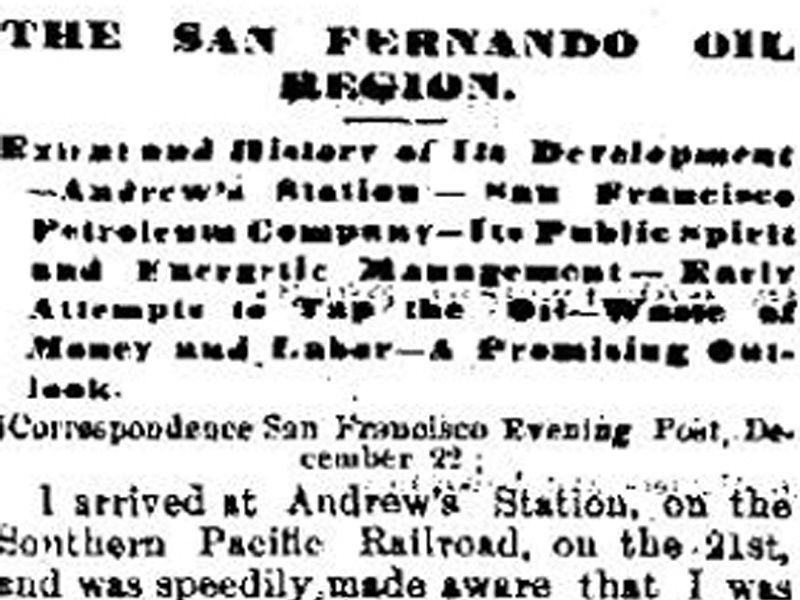 A colossal refinery was built at Alameda, directly across the bay from the important shipping hub of San Francisco. It was a much more practical location for a refinery than far-off Newhall, and so in 1888, the refining operation at Andrew's Station ceased for all time. The original stills from Lyon's Station were removed long ago by their former owner, Standard Oil of California, which changed its name to Chevron USA in 1977. The two larger stills from Titusville still stand, as do their condensers, several storage tanks and one of the chimneys. Another chimney, toppled in the 1994 Northridge earthquake, waits to be set aright by its new owners. "If we had sold the refinery to a private entity they could have torn it down, and we didn't want that," said Curvin, whose company closed escrow with the city of Santa Clarita in April. Curvin said Chevron is working on a plan to help prepare the site for the expected onslaught of a curious public. Until restoration work starts, the refinery will remain safely locked behind chain-link fencing, comfortably resting in the shade of oak and walnut trees. "It will hopefully be open as soon as it is made safe, sometime in 1999," said Weste.